The pre-tournament hype billed the 139th British Open at St. Andrews a comeback spot for Tiger Woods. It didn’t work out that way. Instead, the oldest major tournament in golf was won by one of the most unlikely competitors in the sport. 27 year old South African Louis Oosthuizen earned his first major tournament victory and did so in a very impressive. Oosthuizen led for the final 48 holes and was never seriously challenged as he shot a -16 under par 272. That was 7 strokes better than second place Lee Westwood and eight better than Rory McIlroy and Paul Casey who tied for third. While golf betting odds installed Tiger Woods and Phil Mickelson as the favorites heading into the event, Oosthuizen was all essentially an afterthought. Despite gusty winds that briefly halted play on Friday, Oosthuizen was solid throughout making only two bogeys during the final two rounds of play. Casey mounted the only serious threat to Oosthuizen’s victory, coming within three strokes of the lead midway through the final round. A triple bogey on the 12th hole knocked him out of contention. 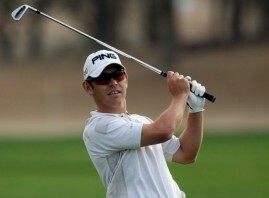 Oosthuizen, meanwhile, was consistant throughout the final round finishing with a -1 under 71. Oosthuizen hails from a very modest background. He’s the son of a farmer and was the beneficiary of the Ernie Els & Fancourt Foundation which helps promote the game among youth regardless of economic background. Oosthuizen’s victory vaulted him to 15th in the world rankings.